We believe that it is important to increase access to learning and play in an outside and natural environment and that exposure at a young age can have a lasting impact. The benefits are well documented. In 2005, Prof M Shayer produced results from the largest longitudinal study of cognitive development over 20 years. In Shayer’s opinion the lack of experiential play was the main factor. His paper supports other research and it is now widely accepted that it is crucial to children’s development to have opportunities to explore, manage risks and develop independence in the outside environment. Many grow up without these experiences for a combination of complex reasons, partly to do with the way our society is evolving. It is worth consulting Sue Palmer’s thought provoking ‘Toxic Childhood’ for a full analysis. Another valuable book, ‘No Fear’ by Tim Gill, argues that activities that previous generations of children enjoyed without a second thought have been relabelled as troubling or dangerous, and the adults who permit them branded as irresponsible. ‘No Fear’ argues that childhood is being undermined by the growth of risk aversion and its intrusion into every aspect of children’s lives. This restricts children’s play, limits their freedom of movement, corrodes their relationships with adults and constrains their exploration of physical, social and virtual worlds. It offers insights into the roles of parents, teachers, carers, the media, safety agencies and the Government and exposes the contradictions inherent in current attitudes and policies, revealing how risk averse behaviour ironically can damage and endanger children’s lives. In conclusion, ‘No Fear’ advocates a philosophy of resilience that will help counter risk aversion and strike a better balance between protecting children from genuine threats and giving them rich, challenging opportunities through which to learn and grow. 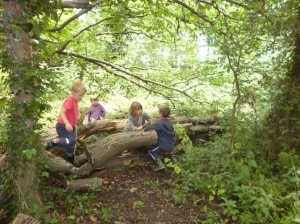 One of our main aims is to help parents and children by giving children safe opportunities to explore their natural environment in a variety of playful, educational and creative ways and also by supporting parents so they can develop confidence in their children’s abilities to manage independence safely. There is also a compelling body of evidence that continued exposure to nature through out life has enormous therapeutic benefits.